Pulled Pork is Da Bomb! I am a huge fan of pulled pork. It found its way into my heart (and stomach) when I travelled to the States for the first time many lives ago. I make mine in a slow cooker because it is easy, hands off, delicious and a lot less smokey! I can pop it on, walk away and come back to yum. I started with this amazing recipe as my inspiration and have evolved and adapted it into my perfect recipe, but huge kudos to this original gem! This takes 5 minutes to put on, is amazing! I am pretty liberal with portions of things. Basically combine all of the ground spices into a rub with the brown sugar and cocoa (sounds weird i know, but yum). Use whatever ratios work for you, I tend to do roughly: 2 tablespoons of brown sugar, 2 teaspoons cocoa, 2 teaspoons cumin, and one of garlic, paprika and chilli. Rub pork with a little good quality olive oil and then rub spice mixture liberally all over pork. Put about one cup of water or chicken/vegie stock into slow cooker, toss in a teaspoon of peppercorns. Squeeze in about 2 teaspoons of mollasses. Add about half a cup of apple cider vinegar. Put your pork in, pop the lid on, set it to low, walk away and laugh manically!! Come back about 4 hours later, you will be able to tell your pork is done simply by putting a fork into an outer part and pulling gently, if it falls apart easily you are done, if not, give it another half an hour and come back. Assuming it is done remove the pork to a tray/baking dish to cool. Carefully (that bad boy is hot) pour the liquid from the cooker through a seive into a saucepan. Set it to a high heat and start working your magic, you want to finesse the sauce and reduce it right down. Simmer for 15-30 mins depending on how much liquid you have. Add BBQ sauce and hot sauce to taste. You can also add more of any of the spices if you think it needs it and some more apple cider vinegar if it needs some sweetness. Once you are happy with your sauce move onto your pork, peel off the outer layer of fat, pull with a fork then stir through your sauce. Your pork will hungrilly gobble the sauce up and be tender and delicious. 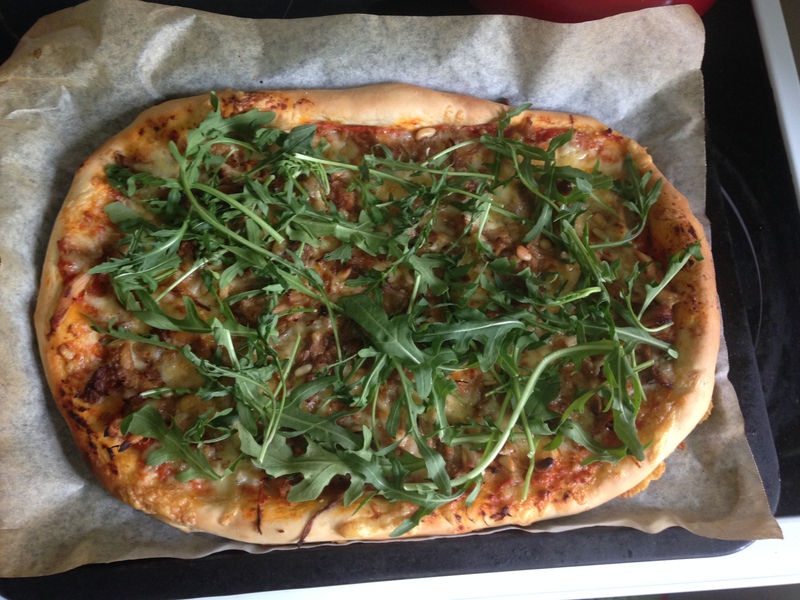 Pulled Pork Pizza with pine nuts and rocket – I whipped up the one below with some left over pork i had, just happened to have the pine nuts and rocket. Made the dough from scratch in no time too!